BANGI, 20 Dec 2012 – Two R&D products of The National University of Malaysia (UKM), Cilibangi and Greenfinity-x solar charger, received overwhelming response from visitors at the recent MAHA 2012 exposition. 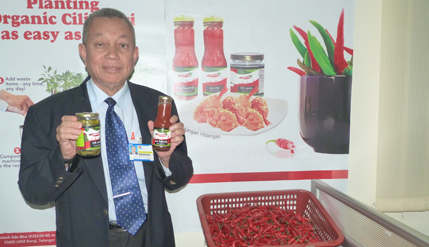 All the chilli sauces and dippings made from fresh red Cilibangi, pickles from green Cilibangi, fertilizers and insecticides made available during the expo were sold-out. 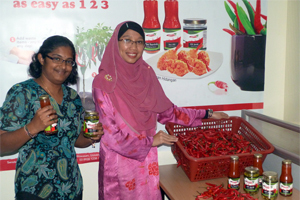 Serotech Sdn Bhd had brought the various products made from Cilibangi as well as its seedlings and starter kits to plant the cilli at home were bought by visitors during the nine day expo. She said Serotech used the MAHA expo as a platform to introduce the products to consumers and for market trial collecting feedback for product improvements before proceeding to large scale production. Another UKM R&D product displayed at the Cilibangi booth called greenfinity-x solar charger developed by Associate Prof Dr Nowshad Amin from the Faculty of Engineering and Built Environmentalso received overwhelming support. Samples of the solar powered charger were displayed to get feedback from visitors but all the charges brought there were sold off at RM150 a piece. Dr Nowshad is now developing the charger’s second generationmeant for laptops. The charger uses solar energy not only to charge handphonesbut the reneweable energy kept in its small battery can be used to light up night lamps. Puan Sharifah Nur Rahimah saidMAHA 2012 showed that Cilibangi self fertigation system, fertilizers and insecticides have market potential as shown by the keen interest of many visitors. Cilibangi was developed and cultivated by genetic researcher, Dr Ahmed Mahir Mokhtar Bakri. The bottled products were manufactured in colloboration with local firms. Serotech will also be taking part at the Green Exhibition to be held at the Mid Valley Exhibition Centre in Jalan Syed Purta Kuala Lumpur from Dec 21 to 23. 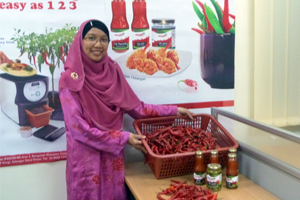 Serotech hopes UKM itself can promotes the value-added Cilibangi products at its shops inside the campus while customers can make their orders online through its website: www.cilibangi.com. The company have started to make door to door delivery for customers who buy its products online. The service is available for buyers around Kuala Lumpur, Selangor, Johor Bahru and Penang. Serotech is selling Cilibangi seedlings at RM5 for the hot and mild hot species and RM10 for its starter’s Kit.